Flying cars exist, but they perform a specialist transport role similar to helicopters due to noise restrictions. They require a special pilot’s licence to fly. Their design is like a compact helicopter with counter-rotating shielded blades. They are not actually cars. The usual form of private transport is the ground car. With Earth’s supply of petroleum long since depleted, several automotive propulsion technologies are in use. Different propulsion technologies enjoy predominance in different regions and on different worlds. Vehicle design has become more modular, with standardised interchangeable components. The basic designs are mechanical vehicles and electric vehicles. Mechanical vehicles transmit the mechanical energy from an engine directly to the wheels. Electric vehicles use electric motors, which are powered by various combinations of batteries and generators. By the middle of the third millennium, cybernetic implants have become a feature of everyday life. Implants can be powered using oxygen and glucose from the bloodstream. More advanced implants can be grafted to nerves so implants can be controlled, and some are even wired directly to the brain. Artificial hearts have become commonplace by the late 21st century. These are usually powered by the body itself, and need no external power supply. For individuals who are unable to tolerate a cybernetic power supply, they can use an older technology power pack using a fuel cell powered by hydrogen. Such a power supply is often implanted as a backup in case the cybernetic power supply fails. Telepathic implants can be used to communicate silently to others who possess a similar implant, or can be used to control devices at a distance by thought alone. They can also receive private messages. The telepathic implant is typically embedded in the skull behind the left ear. They operate by recognising patterns in the brain that encode different symbols, and then transmit these symbols using a standard protocol. Reception can be done using several techniques, however the easiest technique involves the direct stimulation of the auditory nerves in the inner ear using a miniaturized speech synthesizer. First-generation models were developed in the 21st century. These were crude and were only able to communicate three or four signals at most. These models were primarily used by the disabled to open doors and the like, and with some effort could be used by the disabled to communicate. They were too crude for use by people with normal powers of communication. Second-generation devices were able to encode up to thirty symbols, and were thus able to send letters of the alphabet directly. These enhanced the ability of the disabled to communicate, but were still too slow for mainstream use. A major breakthrough in research into the function of the brain allowed the extraction of thoughts directly from the brain with embedded cybernetic wires. These could eavesdrop on individual nerve cells and allowed the direct retrieval of ideas from the brain. This allowed the development of much faster implants suited for mainstream use. These were not as fast as regular speech, but were extremely useful for private speech. The easiest telepathic implants to install are those that are fitted only for reception. These are wired with a receiver and a speech synthesizer and are wired to the auditory nerves. Wealthier people are able to afford a telepathic implant equipped for sending. These are more difficult to install because the user must undergo some training so their brain can use the device. These also employ the auditory nerves because this is the mechanism used to proofread the telepathic messages before sending. A simple implant allows the user to know the exact time. All the user has to do is think the activation thought, and the implant announces the exact time. The implant communicates the time to the auditory nerves, or to a small digital display mounted in the retina. Maglevs are the usual method of middle-distance mass transit on the colony worlds. The technology has evolved to the point where the maglev can be used for frequent stops as well as long-distance commuting. Polarised windows are windows that can admit light as usual, or can be adjusted to admit no light. These circular windows typically have diameters ranging from 30 centimetres to one metre. The windows are made of two sheets of polarised glass that are sandwiched together in a frame with a narrow air gap between them. The windows are made transparent or opaque by cranking a handle through a quarter turn. Some windows have a motor attached so they can be opacified automatically. These windows are most commonly found on tidelocked planets, where the continuous daylight on the world needs to be controlled so that artificial night can be produced. Atomic clocks with cesium oscillators are very precise clocks that became in common use for day to day timekeeping on the settled worlds. These digital clocks employ a miniaturised caesium oscillator to keep the time. Their displays usually have three or five digits. Because most worlds use decimal time, the same clocks can be used on all worlds that employ decimal time. To adapt the clock for a particular world, the user enters a code of ten or eleven digits that corresponds to the length of the day into the clock using any of several setting mechanisms. When set correctly, the clock will keep time to an accuracy of milliseconds per year. The clocks are so precise that the clocks will need to be reconfigured every few years to adapt to the changing length of the day. The cheapest models require the user to enter the settings manually. Clocks that are more expensive have automated mechanisms of various kinds. Hundreds of years of technological development has transformed spaceships from the small, cramped and primitive craft of the mid-twentieth century to a large range of modern spacecraft. There are spacious and comfortable space liners, capacious freighters, mining ships of various kinds, military frigates. Most spacecraft are manufactured in space and never enter the atmosphere of a planet. There is no artificial gravity. Large spaceships such as space liners and freighters produce artificial gravity by rotation. Smaller spaceships that are too small to produce artificial gravity by rotation employ such devices as magnetic boots, acceleration couches and crews that are well trained in zero gravity. There is no hyperspace travel — that is, ships do not have the capability to travel long distances at superluminal speed under their own power. All travel between star systems takes place through stargates. Stargates are also employed for some intrasystem travel. Most spacecraft do not have windows. It is impractical for the crew to have a direct view of space because the space radiation is too hazardous and the rotation of the spacecraft would induce motion sickness. Instead, cameras mounted in the hull transmit a view of space to large displays inside the spacecraft. Computers typically adjust these views to counteract the rotational motion of the spacecraft, thus providing a steady view of the outside. On more expensive models of spacecraft, this adjustment is also made to side views by stitching together the views of different cameras in real time. This is used to create artificial portholes for passengers on space liners. The modern spacecraft is designed to withstand space radiation. Larger ships can have up to ten metres of radiation shielding between the outer hull and the passenger space, which is roughly equivalent to an atmosphere of a planet. The most common shielding employs hydrocarbon polymers such as polystyrene because it is the number of atoms that provide protection from cosmic particles and not their mass. Dense materials such as lead are used to stop high-energy electromagnetic radiation. For additional protection, such as during a space radiation emergency, most spacecraft are equipped with a radiation shelter at the core of the ship. These are small chambers that most commonly are constructed within the water supply tanks or even the sewage tanks. Thus, even human wastes have their uses in the modern spacecraft. The external hulls are not made of large sheets of smooth metal. The space environment includes micrometeroids and it is only a matter of time before any such shiny surfaces are degraded by numerous impacts. Instead, the outer hulls are sometimes constructed of softer materials that are designed to withstand these impacts. One common material is made of fine regolith bound together with spidersilk and sensor fibres. Other designs for spacecraft hulls do employ metals, but do so with small modular panels that can be easily detached and replaced. A typical module measures one metre by one metre. All hull designs include sensors of various kinds that detect when a hull panel has been damaged by a micrometeorite and is in need of replacement. The engine configurations of the modern spacecraft are designed for redundancy in the event of failure. The most common configuration is the septunx which consists of seven engines arranged in a hexagon. This configuration allows for balanced thrust to be maintained even if up to three engines are not operational. 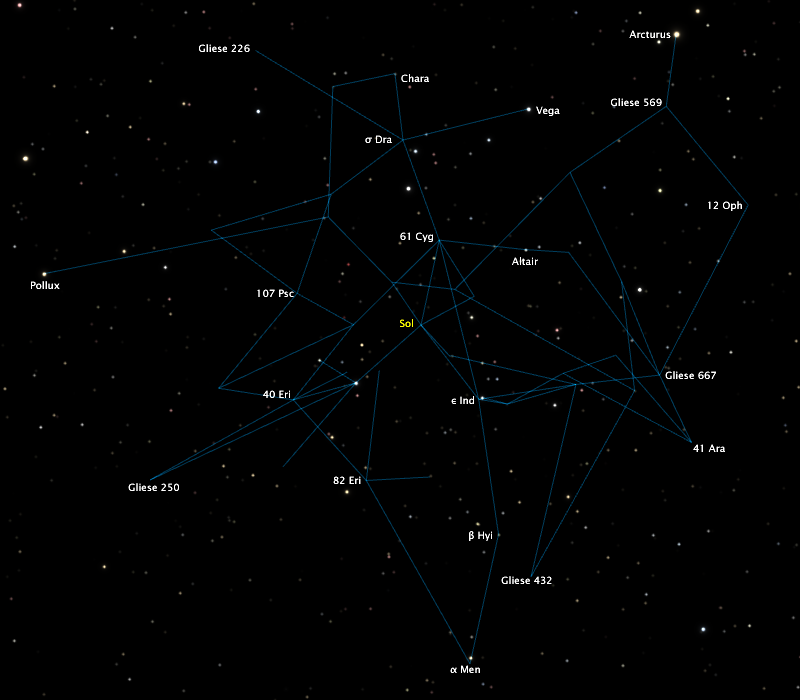 A projection of the stargate network as seen from 70 light years from the Sun. 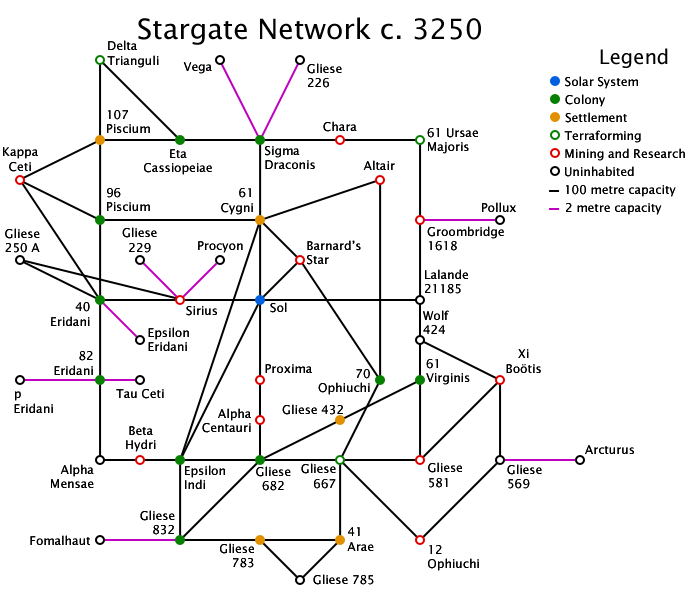 A schematic map of the stargate network. The Stargate Network is a network of artificial wormholes used for interstellar travel. It was initially created from the wormhole probes of the Dandelion Project, and then expanded with new stargates created specifically for the Network. The network is structured so that all inhabited star systems have at least two Stargates; this is to ensure connectivity is maintained in the event of a malfunction that temporarily or permanently takes a wormhole out of commission. The wormhole paths are arranged such that the paths of two wormholes do not cross; this is to minimise the chance of the wormholes spontaneously reconnecting in a different configuration or being destroyed entirely. This document was last modified 2010-07-10 11:24:04 UTC.